Publish assets from Elvis directly on the web. Place previews of assets in your web CMS such as WordPress. Publish links or QR codes that link directly to assets. Use authcred authentication on Elvis URLs. Warning: Anonymous (Guest) users make it possible to be logged in (automatically) many times with the same username/password. This is the typical portal scenario. To enable this behavior, make sure the username begins with "guest", for example "guest_portalA". With normal users, when you login twice with the same user (with the same client type), the previous session is expired. One concurrent user license is required for each unique user name that is logged in. When the same user logs in with multiple clients, only one concurrent user license is consumed. With guest users, sessions that use the same 'guest' username will not be expired. After all, multiple guests should be able to have a session at the same time. Each guest session will consume a concurrent license. Make sure your server is accessible from the Internet. Important: The guest user is of the type API user and requires at least one activated API user seat. Note: The API user cannot be used with the Elvis Desktop client, Elvis Web client or the iPad Review app client. Enable the guest user in internal-users.properties.txt in the server configuration. The standard password 'guest' is usually okay since the user will only be able to access public material. The password won't be secure, since it will be possible to decode it from URLs. The guest user will have very limited permissions and will only be allowed to access content marked as being public. Login to Elvis as administrator and go to System > Manage Rules. 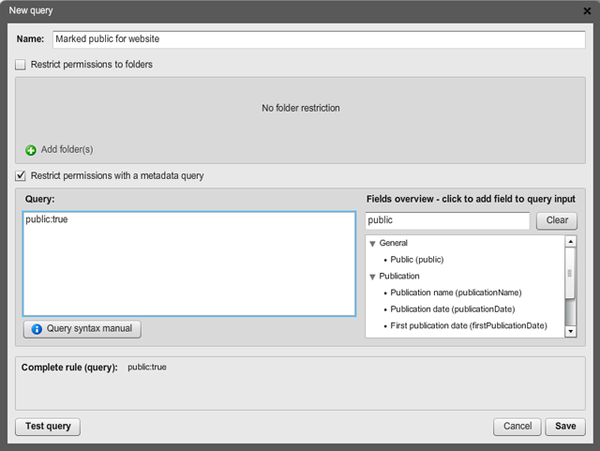 Setup a rule with the query public:true so we can assign permissions based on material that is marked public. Depending on your specific situation you can configure different rules. Just remember that all material accessible to the guest account will be publicly available. Go to System > Manage Permissions. Allow the guest user to view and view previews for all assets marked public. If you need guests to be able to download originals too, then also allow use original.